I’m a bonafied Cajun seafood lover until the day I die, and maybe even after that, so I jump on any opportunity to try new seafood spots. Shells & Tails 2Geaux is a black owned food-truck that can be found in Little Elm, Tx, Aubrey, Tx, & DeSoto, Tx just to name a few. 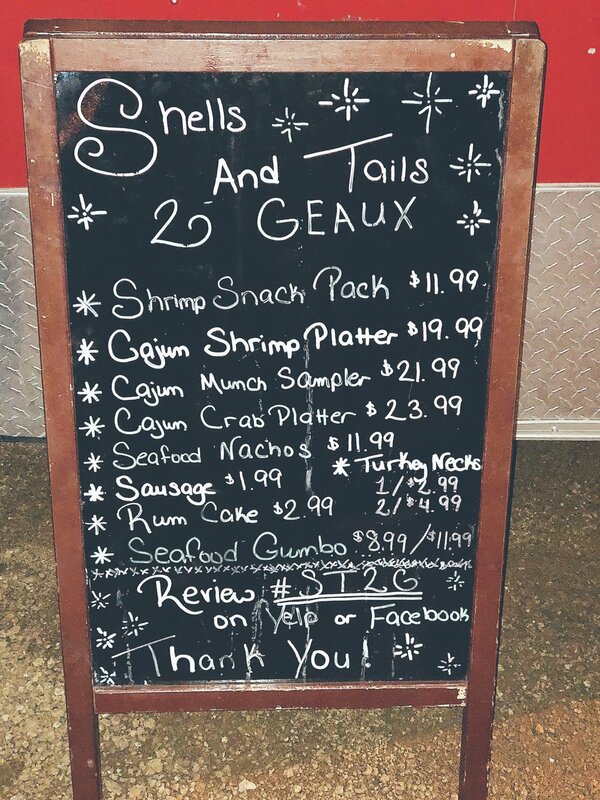 Shells and Tails 2Geaux has a simple and comprehensive menu. Sausage, corn on the cob, & red potatoes come with the platters, the sampler, and the pack. They also have gumbo, turkey necks, seafood nachos, and rum cake. Located next to the window where you order is a detailed list of what comes in each food item they sale. Simply put, the food is BOMB! We got three Cajun Munch Samplers complete with one cluster snow crab, half a pound of shrimp, about three red potatoes cut in half, two corn on the cobs, a sausage link, and butter. We also got a full order and half order of of seafood nachos loaded with Cajun cheese, crab meat, shrimp, and crawfish. Everything and I mean everything we got was good all the way down to the butter. You know how most places skimp you on nacho toppings? Well, Shells & Tails 2GEAUX does not. No chip goes unloaded, and the platters are FULL. To finish off the meal I had some of Shells & Tails Rum Cake & it was so good! It wasn’t too sweet and had a noticeable amount of rum in it, which would be overpowering to some but tasted great to me. I don’t have much to compare it to because it was my first ever slice of rum cake though. If you enjoyed reading this Foodie Blog make sure you subscribe for updates on blogs to come in 2019. It looks like chicken and waffles is becoming the theme around here, let’s see what Lo-Lo’s Chicken and Waffles has to offer! Is 7th & Carson the best brunch spot in Vegas? Will Cinnaholic Make You A Cinnaholic? What’s Valentines Day without a one of a kind gift for your loved one? Whether you’re with you significant other, your friends, or the family this is the perfect movie list for you. What’s a good V-Day without an amazing playlist? This one works whether you’re with your love, the girls, or solo! Have you ever heard an artist that just knocks you off your feet?